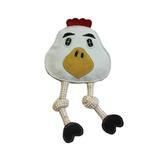 It does not matter what came first - because your dog will love the Chicken Flattie Dog Toy by Aussie Natural. Thanks to the squeaker inside along with the crunchy coconut fiber the Chicken Flattie Dog Toy by Aussie Naturals will provide your dog with ample amounts of chewing fun. Made of Eco-friendly material and rescue tested to make sure your dog will have a clucking good time. Posted On 12/07/16 by Emily G from , Yes, Emily G recommends this product! one of my favorite aussie naturals toys; i love the thick material and leather accents. makes the toys last so much longer. well worth it!